It’s continuous above with the midbrain and below with the medulla oblongata. 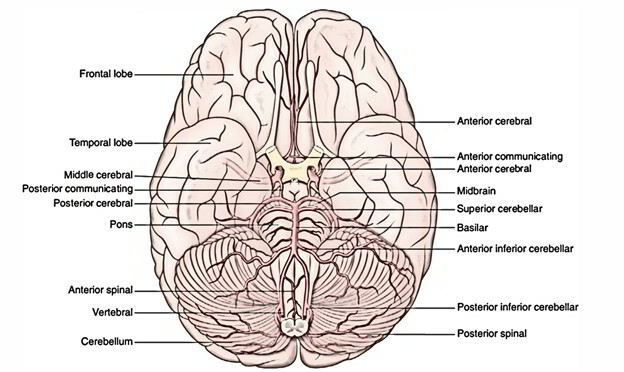 The pons (L. Pons = bridge) is the large middle part of the brainstem. It creates a broad bridge between the 2 cerebellar hemispheres by its transverse fibres making up the middle cerebellar peduncles, which is why it is given its name. On its ventral aspect the vertical median sulcus lodges the basilar artery and for that reason, referred to as the basilar sulcus. The pons is observed to contain a large ventral and a smaller dorsal region, in the transverse section. A large number of nuclei, the pontine nuclei and longitudinal bundles of descending fibres of the pyramidal tract are parts of the venteral portion. Info from the cerebrum to cerebellum is relayed by pontine nuclei and thus, creating a corticopontocerebellar pathway. The dorsal portion or tegmentum of pons includes pontine slumber and respiratory centers. The pontine respiratory center functions with the respiratory center in the medulla to assist in controlling the respiratory movements. The pons has 2 surfaces: ventral and dorsal and 2 edges: superior and inferior. The ventral surface of pons is convex in both the ways, i.e., from before backward and from side to side. It’s transversely striated because of inherent pontocerebellar fibres. In the median plane, it presents a vertical groove, the basilar groove which lodges the basilar artery. 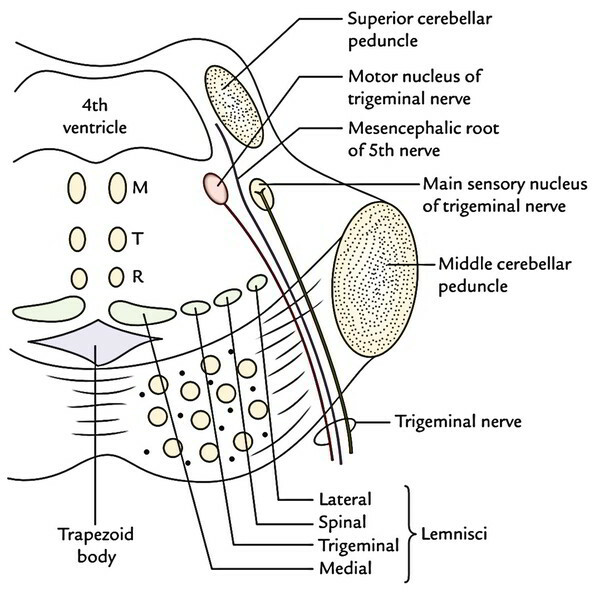 The trigeminal nerve is connected to this surface by 2 roots: a small motor and a large sensory root (the motor root is located medial to the sensory root). Rostrally, the junction between the midbrain and pons is marked by cerebral peduncles and the interceding interpe-duncular fossa; caudally the pontomedullary junction is marked by a shallow groove. In this groove, from medial to lateral, the abducent (6th), facial (7th) and vestibulococh-lear (8th) nerves appear. The superior cerebellar arteries arch along the superior border, interceding between the oculomotor and trochlear nerves. The anterior inferior cerebellar arteries arch round the inferior border. The dorsal surface of the pons is covered by the cerebellum and divided from it by the cavity of the 4th ventricle. The dorsal surface of the pons is triangular and creates the upper part of the floor of the 4th ventricle. A large ventral or basilar part. A small dorsal or tegmental part. The ventral or basilar part is continuous inferiorly with the pyramids of the medulla and on every side with all the middle cerebellar peduncle. The dorsal or tegmental part is a direct upward continuation of the medulla excluding the pyramids. The structure of basilar part is the same at all levels of pons, but the structure of tegmental part fluctuates drastically in the upper and lower parts of the pons. Longitudinal bundles of fibres contain corticopontine, corticonuclear and corticospinal fibres. The corticopontine fibres relay in the ipsilateral pontine nuclei. The corticonuclear fibres terminate in the contralateral (and to some degree ipsilateral) motor nuclei of the cranial nerves. The corticospinal fibres converge toward the lower part of the pons and create the pyramids of the medulla. Transverse fibres originate in the pontine nuclei and cross to the opposite side to create the middle cerebellar peduncle. These are pontocerebellar fibres. Pontine nuclei are scattered on the list of longitudinal and transverse fibres. Tegmental part is traversed by a number of ascending and descending tracts and includes a decussation of transversely running fibres, the trapezoid body. It also includes the nuclei of trigeminal (5th), abducent (6th), facial (7th) and vestibulocochlear (8th) nerves. Since the structure of tegmentum differs in the lower (caudal) and upper (cranial) parts of the pons, it’s studied by analyzing transverse sections at these 2 levels. Transverse section via the lower part of the pons goes through the facial colliculi. The abducent nerve nucleus being located below the facial colliculus in the floor of the 4th ventricle. The motor nucleus of the facial nerve being located ventrolateral to the abducent nucleus. 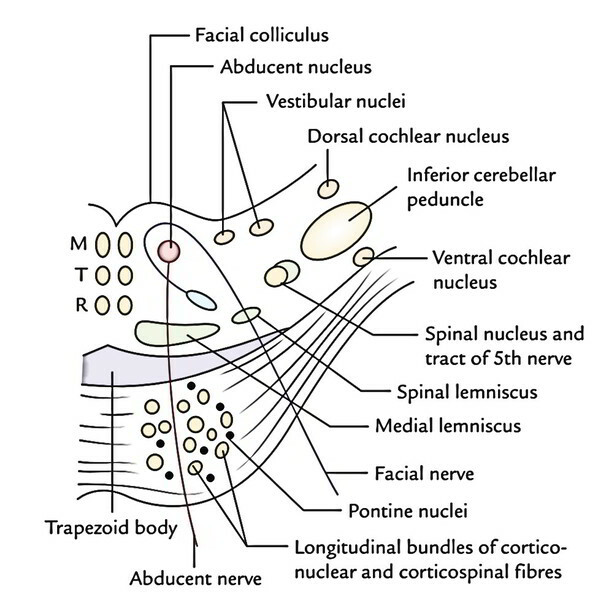 The fibres of the facial nerve first wind round the abducent nucleus, creating the facial colliculus, subsequently pass anteriorly between the facial nucleus and the nucleus of the spinal tract of the trigeminal nerve. The superior salivatory, inferior salivatory and lacrimatory nuclei being located medial to the motor nucleus of the facial nerve. The nucleus of tractus solitarius being located lateral to the superior salivatory nucleus. The vestibular nuclei being located below the vestibular area in the floor of the 4th ventricle. The dorsal and ventral cochlear nuclei situated dorsal and ventral to the inferior cerebellar peduncle, respectively. The spinal nucleus of the trigeminal nerve and its tractlocated on the anteromedial aspect of the inferior cerebellar peduncle. The trapezoid body that’s a trapezium-shaped mass of white fibres being located in the anterior part of the tegmentum, just posterior to the basilar part of the pons. It’s created by the decussation of transversely running fibres originating from the cochlear nuclei of both the sides. The medial lemniscus situated in the most anterior part of the tegmentum with its long axis running transversely. The spinal lemniscus being located lateral to the medial lemniscus and inhabiting the same peripheral position as in the medulla. The medial longitudinal bundle inhabiting a paramed-ian position in the most posterior part. The tectospinal tracts situated ventral to the medial longitudinal bundles. The spinal tract of the trigeminal nerve being located lateral and dorsal to the motor nucleus of the facial nerve. The motor nucleus of trigeminal nerve situated in the dorsolateral part, underneath the lateral part of the 4th ventricle. The appearing motor fibres go anteriorly via the substance of the pons and way out on its anterior surface. The primary (primary) sensory nucleus of the trigeminal nerve situated lateral to the motor nucleus. The white matter at this level includes the same ascending tracts as in the lower part. On the other hand, the lateral lemniscus is nicely created here. The spinal lemniscus is located between the medial and lateral lemnisci. The trigeminal lemniscus being composed of trigeminotha-lamic fibres is also found between medial lemniscus and spinal lemniscus. The ventral part of tegmentum, immediately posterior to the basilar part, presents 4 lemnisci. From the medial to lateral side, these are: medial lemniscus, trigeminal lemniscus, spinal lemniscus and lateral lemniscus. Numerous (pontine) branches from the basilar artery. Millard-Gubler syndrome: It results from a lesion in the lower part of the pons that is so set that it consists of the pyramidal tract and the emerging fibres of the abducent and facial nerves. Ipsilateral medial squint because of engagement of the abducent nerve. Ipsilateral facial palsy, because of participation of facial nerve fibres. Contralateral hemiplegia, because of engagement of the corticospinal tract.